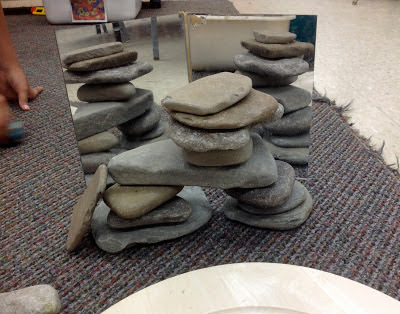 I have been experimenting with loose parts as artistic expression for a few years, more on my own or with my children, but as I learned about Reggio-inspired classrooms and saw images of students creating installation-type artwork in primary classes, I began to see the possibilities for my Kindergarten class. Another way I like to think of it: I stopped putting out glue as a way to capture natural materials in artwork, and started playing with balance, pattern, movement and time. Two boys collaborated to make "Disneyland: a perfect day to go to the park". The problem-solving that took place in the creation of this park was remarkable. Those who follow me on twitter, vine or Pinterest have seen this as my icon. Last year I began rather small, with a table-top centre containing sand, stones and pine cones we collected on neighbourhood walks, daily collections of more ephemeral things (dandelions, leaves and seed pods, flowers and blossoms from trees, feathers). At the left is one of my favourite images from that centre: a theme park with many rides, a partly-cloudy sky in behind, and brightly-coloured flags soaring high above the waterslide and pool. I brought some smooth, flat stones from my nearby beach and added materials from around the room as more and more students took an interest. We made a Voicethread story to share the creations made (note: sound quality on my previous computer is rather bad!) 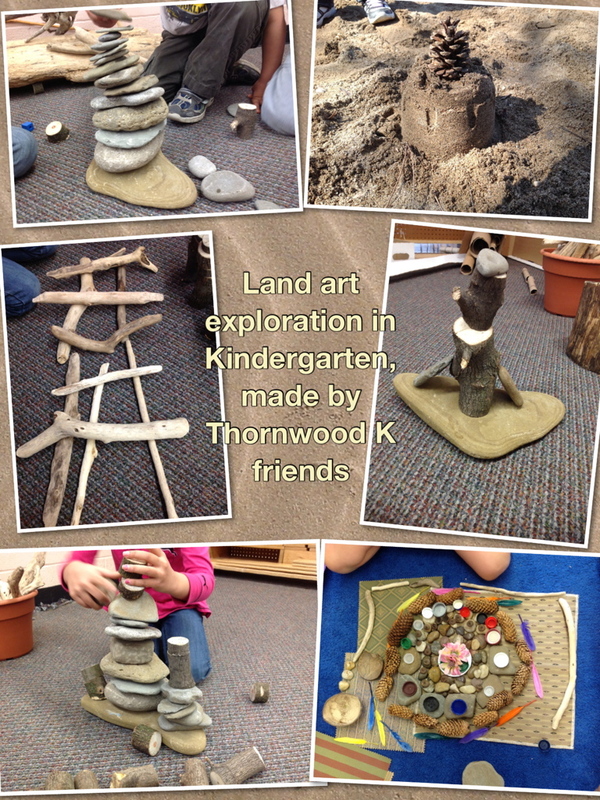 after I showed the children some videos and images of my favourite land artists. Many of those artists were shared at the "sticks and stones" workshop, and thus linked in my previous post. This year I made a concerted effort to collect materials that would provoke my students. 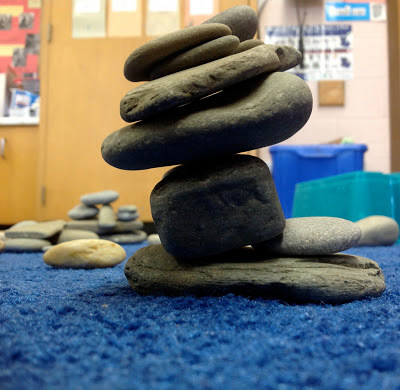 During the year, previous large-group inquiry projects had taken over much of the room, spilling from the wonder table to nearby tables, to the carpet, to the walls. I hoped my enthusiasm for creating "ephemeral art", or works that cannot be hung up on the wall when finished, would be catching. Each trip to my local beach meant taking home a bucket of stones, bricks, and beach glass, and boxes of driftwood in all shapes and sizes. Class walks to the park lead to a growing collection of pine cones, feathers, and dandelions. My friend and teaching partner D loaned me tree slices from a recent pruning. After students explored the materials for a week or so, I began to introduce photos and short videos about the artists who work with sticks, stones, and other natural materials. The excitement was palpable. "Oooh's" and "Aaaah's" when I showed my photos from when Peter Reidel last came to create his seemingly impossible balance sculptures at the local beach (click here to see photoset of Peter's work). 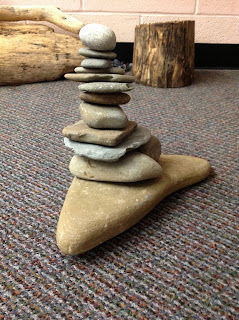 Complete, awed silence when I showed clips of Andy Goldsworthy's stone balance works, followed by applause. When the lights came on and students "tip-toe'd off to activities", loose parts began to spread about the room. I have to admit, my heart soared. Precariously-perched or perfectly balanced? Peter's visits always leave me in awe. There are many images to share, and as I began collecting for this post, I realized that once again I had much more to say than would fit sensibly on one page. 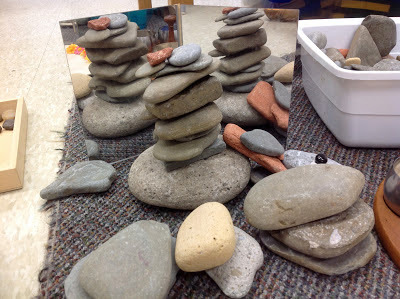 As at our workshop, where we shared various different aspects of working with natural elements at different exploratory centres, I will break up the land art inquiry projects into sections as well. The first spark that caught, initially from the materials set out and then from the images shared, was the balance work of Peter Reidel (click here for P.R. 's stone balancing site). I have met Peter on several occasions over the years, stopped to photograph him at work as he selects and stacks the enormous, flat stones on Long Branch beach, and this spring asked if I might share those photos with workshop attendees and students. He graciously agreed. I had told a few students about seeing his creations pop up at the beach, first in March and then again in May. Their interest soon spread, and I knew I had a new project to follow. 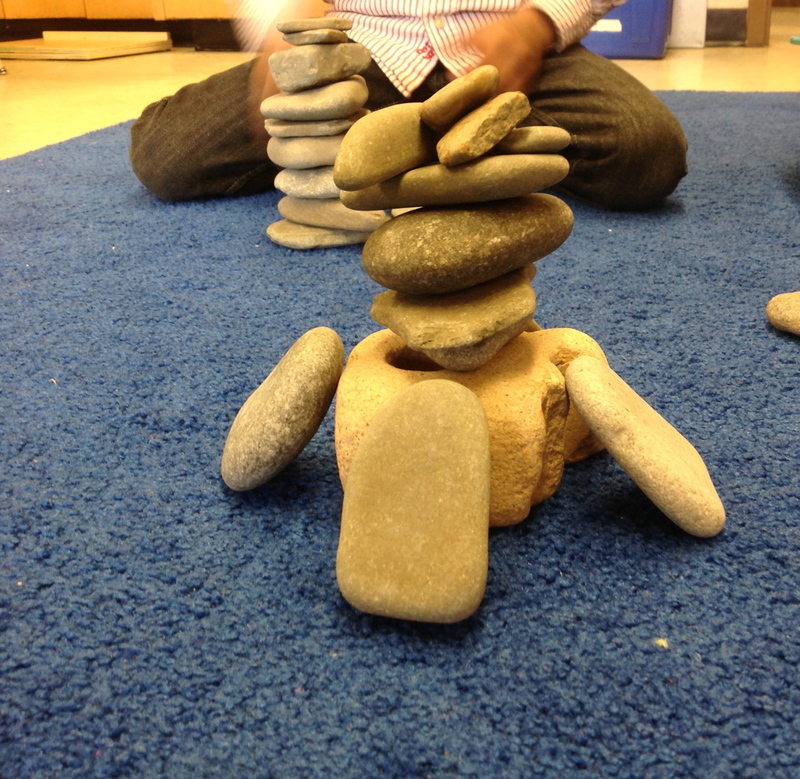 Here are some of the wonderful creations that my students made at play. Adding mirrors to their work add complexity and interest for S, and A (above). F says: "Because it is a balance type of staying well, it won't fall". I have noticed in past posts that video clips show up on the laptop or computer but not on the iPad. I have several short vine clips from moments that students asked me to capture, and in order to make them user-friendly for iPad owners I will add them here as links. Note: in some browsers 'vines' open with the volume set to mute; if you wish to hear the sound simply click on the speaker icon on the top left of the image. 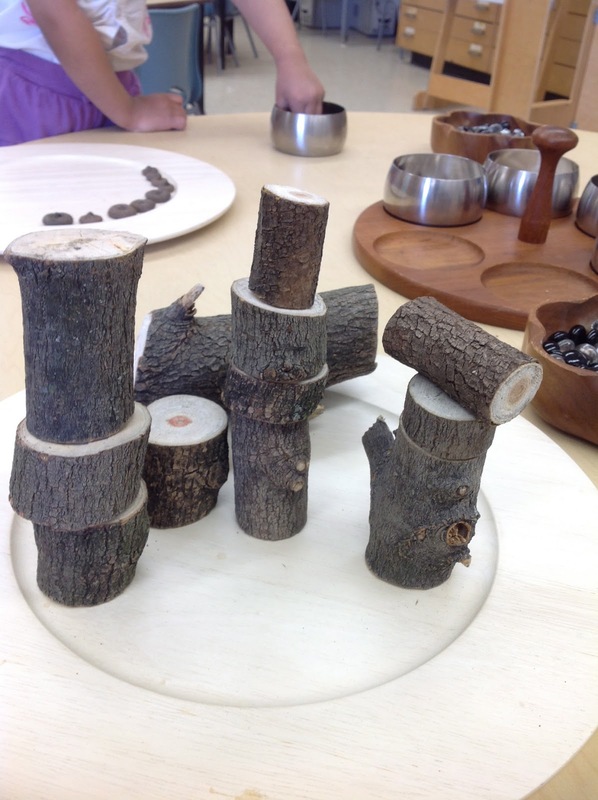 One aspect of loose parts play that differs from other visual arts projects (but not from music or dramatic arts, I notice) came to me as I watched my students last year and this: loose parts play is almost always collaborative. The problem-solving and complexity of the play is astounding. I will revisit this "aha" in more depth another time. 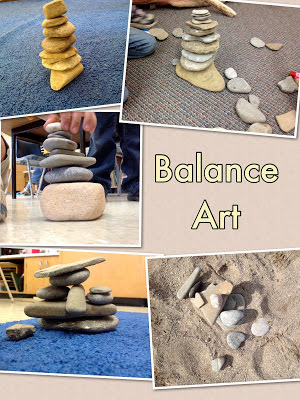 Love the kids' work with balance. Will definitely check out Peter Reidel's site too. It was meant to be that I read this post today. Family was at a beach yesterday picking stones of various shapes and sizes for rock building. 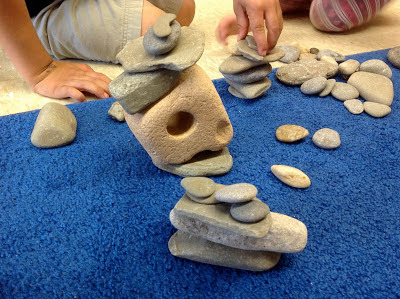 Also like to see kids use rocks to create Eco-art. http://goo.gl/NnpwZ. Thanks for inspiring! Thank you! I think my love of loose parts play comes from two places: first, I fell in love with Andy Goldsworthy's work the instant I saw it, back in teacher's college. I remember how the room went silent, and several of us were near tears. Secondly, I live near Lake Ontario and one simply cannot be bored at a beach! So I'm happy to share, but truly it is the materials that inspire. Wow! What a great post as the year end is closing upon us so quickly. 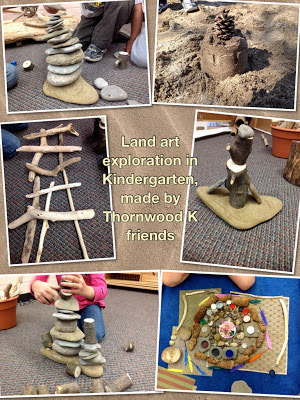 I am extremely happy to have been inspired by the loose parts art you have so generously shared via twitter pics. This is definitely a keeper centre in my class. Thank you Kim! I may be able to bring a few items (nothing too heavy as I'm carpooling!) when I come to Joanne's open house. I'm delighted to see your pics and others as loose parts play takes over classrooms far and wide. We can see birds... everywhere!